Generally, we avoid science, and craft kits marketed at children, simply because after you've purchased a few, you begin to realize you could put together the same supplies and information, with very little trouble, for a fraction of the cost. However, there are some kits that are worth the price - the ones that come with all of the supplies, and reusable tools, necessary to complete, and repeat, multiple projects, or that provide information, experience, or supplies you might not normally be able to find in stores. And, although we tend to steer clear of kits at stores, simply because it can be easy to be drawn into their clever packaging, or often empty promises of "hours of fun", we do fall prey to them from time to time. I'll admit I'm a sucker for just about anything with the Klutz or Insect Lore name on the front. And, we often receive them as birthday, or Christmas gifts. Temptation can be hard to avoid one hundred percent of the time, and the marketing profession as a whole, knows the homeschool mother (and parents in general) - and what she wants to hear. So, since buying the occasional kit, whether it's the frugal, and intelligent option or not, seems inevitable, I thought I'd take some time, this summer, to share a few, that have been winners for our family. G (age 12), received The Origami Kit, 40 Fun and Practical Projects, Including Folded Animals, Toys, Jewelry, and More, for her birthday. 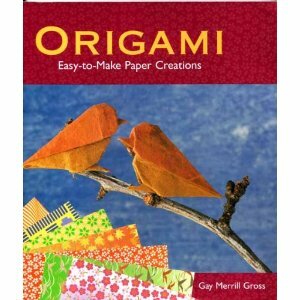 It included Gay Merrill Gross', 117 page, Origami Easy-to-Make Paper Creations, and 30 sheets of paper. The book turned out to be one of the best Origami instructions books I've seen, yet. Keep in mind, I'm a visual learner, so you might have a different opinion, but this has been the first book, that the children (mainly the older children), and I have been able to follow step-by-step, through origami projects, with success. Below are a few of the things we made the day we opened it. The book has since disappeared into the girls' room, where judging from the large number of folded items coming out, I'd say it's being put to good use. The remains of the kit - the cardboard box, and the sheets of paper, were left behind, though. The paper did not turn out to be all that special, or the right size, or of a sufficient amount, to complete the projects in the book. And, since most of the projects suggest using other paper, often thicker paper, such as wrapping paper, or notebook paper, or the like, the paper from the kit was not really necessary. In fact, often since it's the wrong size, it ends up fouling up what could be a nice project. You might notice the purse in the picture above. It was made following the same instructions for the itty-bitty, sort of useless, piece of gum/stamp/coin holder, also in the picture. But, instead of using the provided paper, the girls used a paper bag. ...for a carry along, color-your-own-purse-activity for the younger girls, which turned out to be a great road trip, boredom buster, for them. So, to recap: Kits? Sometimes. The Origami Kit? Book - yes, for ages 10 and up. Kit - no. I love finding the books in second hand sales. Often they do have great directions, but the products are not great to make the actual projects. Once you get the books you can make some great projects. Your origami flowers are lovely and that purse is really great idea! What, no folding instructions? :) Guess we'll have to get the book. My mother-in-law buys my daughter various crafty kits. The reason I don't like them much is that they are often hard to store. I have room for books but not flimsy, bulky containers. I have had good and bad experiences with kits too. I'm very interested in hearing more about the kits you like and don't like. I love the idea of that color your own purse!!!!!!!!!! I'll have to see if I can do that for R.
Thanks for sharing your pictures of Origami. My two daughters have always been interested in it. Sometimes I find silence in my house and I go seeking to see why...well blame it on Origami! I feel the same way about kits. But when we receive them as gifts, we love them. I do buy them when the total cost of all the items is greater than the kit itself. So, if it's cheap, well-made, and hard to put to find items, I usually go for it. But in most cases, if you are resourceful enough, you can make your own. Most of the time, paper, scissor, and tape seem to suffice the creative urge to create.